At its humble beginning back in the 1980’s The Mae Tao Clinic was a very simple, one room building with only a rice cooker to sterilize instruments. Today Mae Tao Clinic provides health care to over 150,000 displaced people per year. The Child Recreation Center at the old campus. Very subject to flooding! Did you know that the Mae Tao clinic provides free medical service to Burmese immigrants and displaced persons along the Thai / Myanmar border in Tak province? They see between 300 and 400 patients a day, six days a week! Many travel great distances to be seen at the Mae Tao Clinic, where they can receive quality medical care in a safe environment. There is no financial obligation for the patients, this health care is funded by donors some large and some small. Did you know that many big donors have re-directed their giving to within Myanmar, leaving Dr. Cynthia Maung and her team with horrendous funding shortfalls? While there has been some progress in Burma, many citizens are still ostracized by the government. They continue to come to Mae Tao Clinic because other options are not yet available. The most optimistic predictions indicate that the Mae Tao Clinic will be an absolute necessity for at least the next five years. Most feel the clinic will be needed for at least the next 10 years. After years in the planning stage and construction since 2011, the new campus of Mae Tao Clinic officially opened 28 May 2016. However construction continues. It is anticipated that the full campus will be finished in approximately 2 years (2018). The lease on the old campus will continue to be in effect until the end of 2017. In the meantime that area is being used for training rooms and temporary housing. The acupuncture clinic and the prosthetics lab are still at the old campus and will move in the future. Mae Tao Clinic has expanded its scope of service to three main areas: Health Services, Training and Child Protection. Learn more at www.maetaoclinic.org The things they are accomplishing is truly amazing! From the CMIRC’s inception, we have continually tried to support the Mae Tao Clinic We realize that as a small club we can’t possibly do all that’s needed. That said, there is much we have done, are doing and will do in the future. We actively seek other Rotary Clubs to help Mae Tao Clinic. Mae Tao Clinic touches on all six areas of Focus. Peace and Conflict/Resolution: Their work with indigenous hill tribe and other ethnic minorities makes a difference in conflict resolution within Myanmar and along the border in Thailand. The medical training and health programs inside Burma also help to reduce tensions. Mae Tao Clinic’s birth registration program allows babies the opportunity to flourish by giving them the beginnings of opportunities to be educated and work in Thailand, Myanmar. Disease Prevention and Treatment: This is Mae Tao Clinic’s original and still primary area of focus. They have programs for the prevention and treatment of denge fever, malaria and much more. 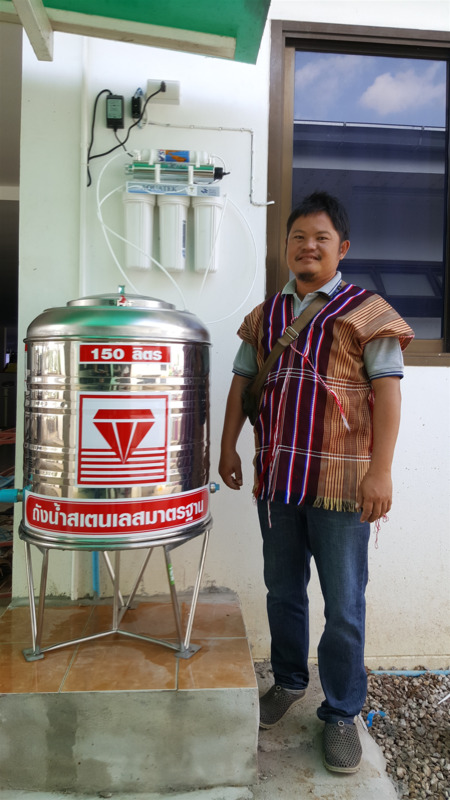 Water and Sanitation: As their community based training and treatment expands Mae Tao Clinic must deal with water and sanitation issues in poor villages and schools on both sides of the Thai / Burma border. 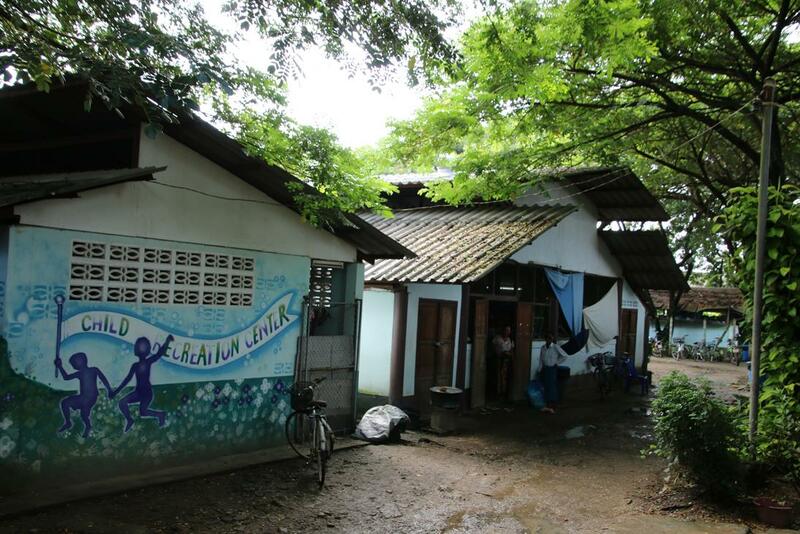 Maternal and Child Health: This is one of the largest areas of focus for the Mae Tao Clinic. The new born babies at Mae Tao Clinic have a much lower morbidity rate than babies born in Burma. Basic Education and Literacy: Mae Tao Clinic focuses on the child. Their Child Development Center can take as many as 1,000 migrant children. Economic and Community Development: Mae Tao trains medics to work in Myanmar. This project touches lives of people who otherwise might not have any opportunity to make meaningful contributions to their society. The Mae Tao Clinic Training Program alone touches all six areas of focus. Introduce Members and Guests: Because the Mae Tao Clinic is located in Mae Sot, some 360 kilometers from Chiang Mai, it is not practical to have daily contact. 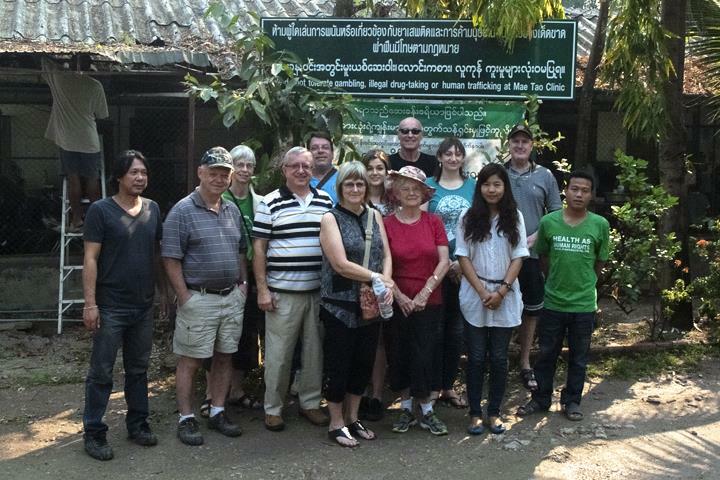 However, several trips have been organized for the purpose of introducing our members and friends to The Mae Tao Clinic. The more people who are aware the more support we can garner. One example is an American Couple Tom and Alene Tunny who are working with their local Lions club to provide support of Mae Tao Clinic’s Eye Clinic. Another fine example is Rotarian Neal Herman of the Estes Sunrise Rotary Club. The orientation trips will continue. Mae Tao Clinic’s Burma Flood Relief Project Horrendous flooding occurred in many parts of Burma in 2015. CMIRC donated 26,400 baht to Mae Tao for their flood relief project. We knew the money would go to help the flood victims. Boys Dorm: On the 28th of February, 2015 in Mae Sot Thailand a sugar cane farmer burned a field. It was a windy day and the result was the loss of 2 buildings that were home to 62 boys and 2 teachers from Mae Tao Clinic’s Child Development Center. An emergency fundraising effort spearheaded by a member of Chiang Mai International Rotary Club raised 134,300 baht which was donated to Mae Tao Clinic on 10 March. 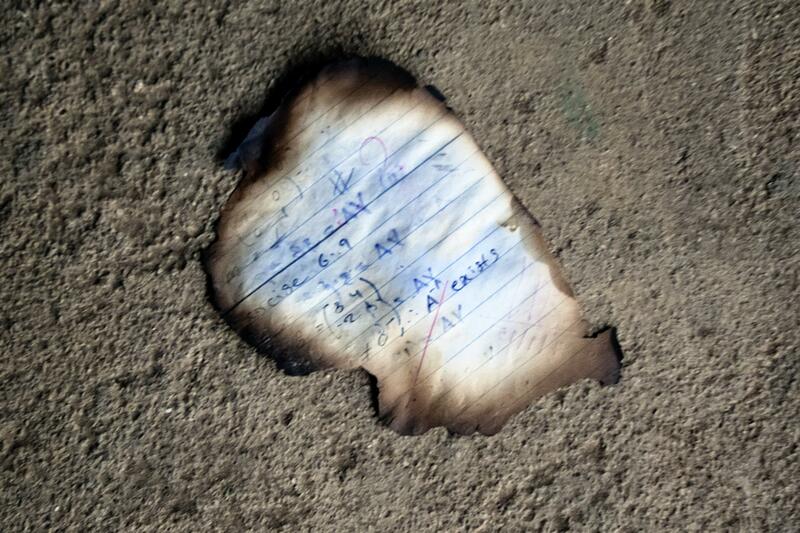 The boys lost everything that was in the dorm, papers, study papers, clothing, everything! Child Recreation Center: As a follow on to the fund raiser for the Boy’s Dorm another 10,000 baht was collected and transferred to Mae Tao Clinic. Largely because of a an emergency grant The Rotary One, Hong Kong the new Boy’s Dorm was fully funded. Therefore, we were able to earmark this 10,000 baht for the Child Recreation Center at the new clinic. Money was transferred on 19 May 2015. 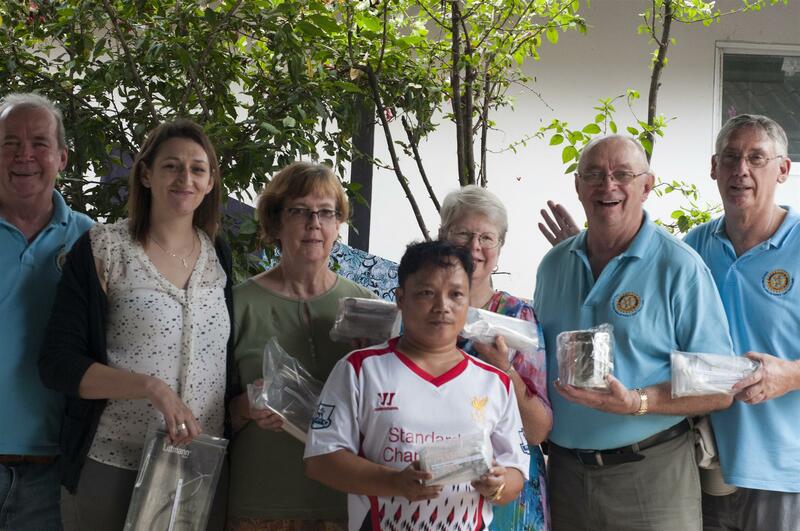 Surgical Equipment: In September 2014, CMIRC teamed with the Chiang Mai Expat club to provide some 60,000 baht worth of badly needed surgical equipment to the Mae Tao clinic. The club recently subsequently received a second list of needed equipment; we are looking at ways to provide these items. A Compassionate Connection: A gentleman by the name of Bill Feetham passed away in Chiang Mai. His widow Fran Decoster contacted Roger Lindley, our Charter President. She had several pieces of expensive hospital equipment including a hospital bed, a machine that generates oxygen, an aspirator and much more. She wanted to donate this equipment to the Mae Tao Clinic. A couple of days later, on Friday 21 March 2014, two Rotarians picked up the equipment and the next morning we delivered it to Mae Tao clinic where it was put to good use. This was an opportunity to be of service by provided by a compassionate connection. CMIRC was able to facilitate community needs and strengthen the bond between Mae Tao Clinic and CMIRC, Bill Feetham has a bit of his legacy at work helping the people who need the equipment. Child Protection Training Program; We raised 159,700 baht for the Child Protection Training Program. The total budget was 156,700. The extra 3,530 baht was designated to support the nursery at the Pa-Hite clinic. Funds were transferred in 4 segments, the last on July 4, 2016. The MTC Maintenance Engineer came up with 2 filter systems making it possible to install all 10 water tanks. This project was a great success. Thank you one and all who generously gave. The Current Project: G.E.D. training for deserving students in the the Burmese Migrant / Refugee population. If in Chiang Mai, just hand Jerry Nelson a check or cash. Contact me at jerry@cmirotary.org or +66 89-556-4293 for more for details. Please contact Jerry@cmirotary.org for details.